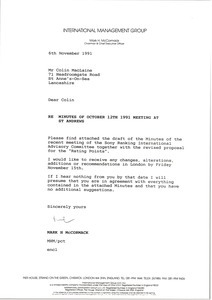 McCormack writes regarding an unsuccessful patch deal with golfer Mark Calcavecchia and Sony. He would like to do one now with golfer Ian Woosnam. 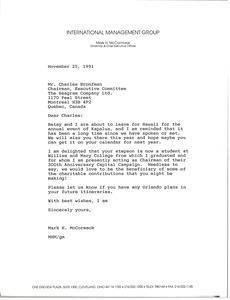 McCormack is delighted to hear that Bronfman's stepson is attending William and Mary, and suggests Bronfman make a charitable donation to the college. 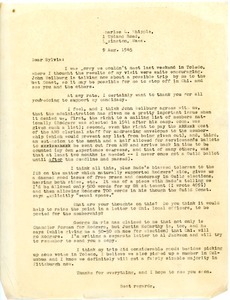 Included with letter is a letter to McCormack from Edward Allenby of William and Mary asking McCormack to write the letter to Bronfman. Attached articles about William and Mary not scanned. 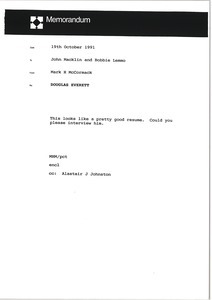 McCormack sends a letter and resume from Douglas K. Everett. Chevy Chase (Md.) - Glad he has been nominated for Secretary-Treasurer. Offers help to support the candidacy. Sid is for Rodgers, but will allow workers to vote as they wish; names of others who may support. 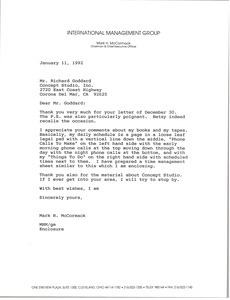 McCormack writes regarding sponsorship of Russian pianist Evgeny Kissin. 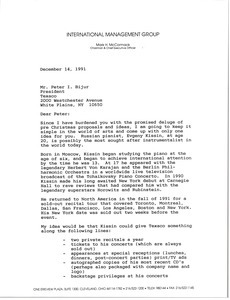 A biography of Kissin is included as well as a number of articles from various sources. 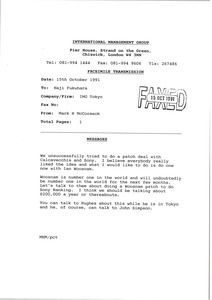 A draft memorandum with handwritten edits is included. Enclosures not scanned. 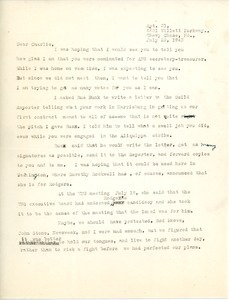 In response to Goddard's letter, McCormack encloses a sample of the time management sheet he uses daily, with a column for "phone calls to make" and "things to do." 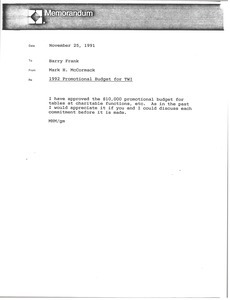 Concerning the approval of the budget for the TWI. Lexington (Mass.) - Believes the "administration has given me a pretty important issue when it denied us" use of mailing lists in the ANG election. 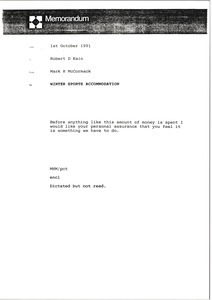 McCormack sends a letter and floor plan from Leslie McCormack regarding a house in Talloires, France for winter sports accommodation.